SAN LEANDRO, CA, Oct 17, 2016 – Type A Machines, Inc., a market leader in industrial-grade fused filament fabrication (FFF/FDM) 3D printers, announced a collaboration with 3D printing technology company Mosaic Manufacturing Ltd. to bring multi-filament FFF printing to the US market. 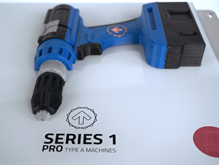 Type A Machines will make the Mosaic Palette available directly as an integrated bundle with the company’s Series 1 3D printer via the company’s online store. The Mosaic Palette is an innovative 3D printing accessory powered by the company’s proprietary series Enabled extrusion of materials (SEEM) technology. With Palette, existing and new Series 1 owners can print single objects with up to four filaments without sacrificing performance or permanently losing space from the printer’s large, cubic foot build volume. In addition, Palette along with a Series 1 avoids the high learning curve, and technical limitations of the various multi-extruder solutions being attempted. Palette features the industry’s first closed-loop feedback system to ensure each print stays in-sync, layer after layer – while providing for the cleanest 4-color printing on the market. Palette was brought to market after a successful 2015 Kickstarter campaign, which validated both the company’s approach and the market demand for a multi-color option that is more accessible, usable, and capable than current multi-head extruder market offerings. Palette assembles a single strand of filament by using multi-extruder information to determine the length, and the order of each filament segment. A cutter and splicer then assemble each segment to create a single strand for extrusion. In this method, users can combine materials with different finishes and colors to create objects like never before. Palette, in conjunction with the exceptional material capability of the Series 1 G2 Extruder, opens the door for entirely new applications in multi-filament printing. Full documentation, as well as specialized parts to connect the Palette to a Series 1, are included as part of the Palette for Series 1 bundle. Customers can immediately sign up to reserve their Palette for Series 1 at the Type A Machines online store. The retail price is expected to be US$999. Customer shipments are planned to begin in early January 2017. Type A Machines, Inc. designs and manufactures the Series 1 and Series 1 Pro FFF/FDM 3D printers, and the industry-first Print Pod, a centrally-managed parallel production solution scalable up to 60 individual Series 1 3D printers. The Series 1 and Print Pod deliver a production solution at a lower cost­-per-­part than injection molding and are ideal for makerspaces, print farms, low volume production, labs, classrooms, and other heavy printing environments. An industry pioneer, Type A Machines continues to deliver the future of 3D manufacturing to customers, today. Mosaic Manufacturing Ltd. develops multi-color and multi-material 3D printing technology, with a focus on expanding the range of objects FFF/FDM printers can create. Since its founding in 2014, the venture-backed, Toronto-based company has focused on developing hardware technologies that enhance 3D printers’ capabilities. Its flagship product, Palette, combines these hardware advances with software to enable single-color 3D printers to print with up to four filaments at once with ease. This entry was posted in CAD-CAM-CAE, Featured News on October 17, 2016 by Sharmila Guha.